I’m going to start this off by saying that this is my own personal list – I am not a scout. That said, I am someone that watches a lot more junior hockey than your average hockey fan. I am located in Ontario and am not going to hide the fact that I have a bias towards the OHL. I see some of these players play a heck of a lot more than others so obviously, that’s going to skew my view of them. With that said, here is the list of my top-100 prospects for the 2017 NHL Entry Draft. 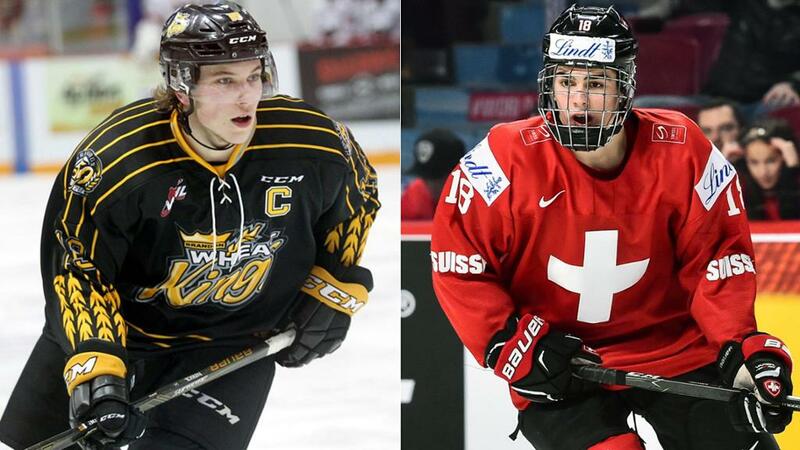 Nolan Patrick – C – Brandon Wheat Kings (WHL) – He’s the best player in the draft and had he played a full season without health issues, there wouldn’t be a debate about who goes #1. Every time you see him dropped to #2 on a list, the argument is “Hischier is more dynamic” – the exact same thing we were hearing last year when people tried to justify picking Laine ahead of Auston Matthews. Nico Hischier – C – Halifax Mooseheads (QMJHL) – Hischier is a really good player. He’s fast, strong and is absolutely lethal with the puck on his stick. He put on a clinic at the World Juniors and made the hockey world fall in love with him. He’ll be a very good offensive weapon in the NHL – I just don’t think he brings the total package the way Patrick does. Gabriel Vilardi – F – Windsor Spitfires (OHL) – This is where things get interesting. Gabe Vilardi is a kid that grew up as a winger and only played part of the season down the middle for Windsor. Despite that, he has the size and style of play that has NHL scouts believing he’s destined to be a top line center. He started slowly because of injuries, but over the second half of the season, Vilardi turned into one of the best players in the OHL. Once seen as a weakness in his game, Vilardi’s skating has improved significantly over his time in the OHL – though he’s still got a very awkward stride. Elias Petterson – C – Timra IK (Allsvenskan) – He’ll have to get stronger to stick as a center in the NHL, but Elias Petterson is a player that does absolutely everything well. He has incredible hockey sense and the kind of player that ends up being a very valuable second fiddle on an elite team. Timothy Liljegren – RD – Rogle BK (SHL) – He’s the best defenseman in the draft – of that I have little doubt. A battle with mono sent his season on a trajectory that he couldn’t recover from. Like Chychrun last year, Liljegren is going to tumble on draft day – then proceed to make a bunch of teams look very silly. Owen Tippett – W – Mississauga Steelheads (OHL) – Owen Tippett has a very simple game – skate fast and shoot the puck. He’s an elite goal scorer that in the right situation will consistently put up 30 goal seasons. He’s going to be a good NHLer, it’s just a matter of how good. Casey Mittlestadt – C – Green Bay Gamblers (USHL) – Here is a guy that will be drafted on pure potential. He’s got the raw skills that look elite – now we just need to see how he does against better competition. He’s not in great shape – that was evident by how poorly he did at the combine. Some scouts believe that if he’s this good while out of shape, the sky is the limit if he starts to take his fitness seriously. Cody Glass – C – Portland Winterhawks (WHL) – A big two-way forward that put up big numbers in a system that helps players inflate their statistics. Glass has the potential to be a great 2nd center in the NHL. I have him below Mittlestadt because while I don’t think he has the same top-end potential. Nick Suzuki – C – Owen Sound Attack (OHL) – my favorite player in the OHL this season. Suzuki is possession monster that may fall in the draft because scouts don’t see him being able to do the same thing in the NHL. He’s got high-end puck skills and the ability to make his linemates better. It sounds like someone might jump p to grab him early in the first – but if that doesn’t happen, Suzuki is the kind of guy that could go on an inexplicable slide in the first round. Miro Heiskanen – LD – HIFK (Liiga) – Heiskanen was great at the U18 and as a result has had the hype train run wild – one scouting service had him as high as #1 on their board. He’s very very good – and definitely, has top-paring potential – but I’m not sure if he has the ability to be a #1 guy in the NHL. Cale Makar – RD – Brooks Bandits (AJHL) – Speaking of the hype train. I like Makar a lot, just not as much as some people. He’s a great skater and will be a high-end puck mover in the NHL, but like Heiskanen, I’m not sure he can be a #1 on a good team – though admittedly, I haven’t seen him play all that much. Robert Thomas – C – London Knights (OHL) – Now for someone that I like a lot more than most. Robert Thomas got off to a slow start to this season and very much looked like a player that was trying to find comfort in the lineup. When comfortable, Thomas definitely has that wow factor. He plays a 200-foot game, but unlike some ‘two-way’ centers he has the potential to be elite offensively as well. Kristian Vesalainen – W – HPK (Liiga) – Scouts are afraid of a lack of production this season – despite the fact that he was a 17-year old playing professional hockey all year. In international tournaments against players his age, Vesalainen has been absolutely dominant. Kailer Yamamoto – F – Spokane Chiefs (WHL) – He’s small, but man does he have some serious skill. One of the best 5v5 producing draft-eligible players in the CHL, Yamamoto is a guy that will pay huge dividends to the first GM that is able to overlook the number when he steps on the scale. Ryan Poehling – C – St. Cloud State (NCAA) – The youngest player in NCAA hockey this past season, Poehling is big, smart and has shown the ability to develop quickly. He’s good in front of the net, strong on the puck, and has all the makings of being the prototypical middle-6 center in the NHL.